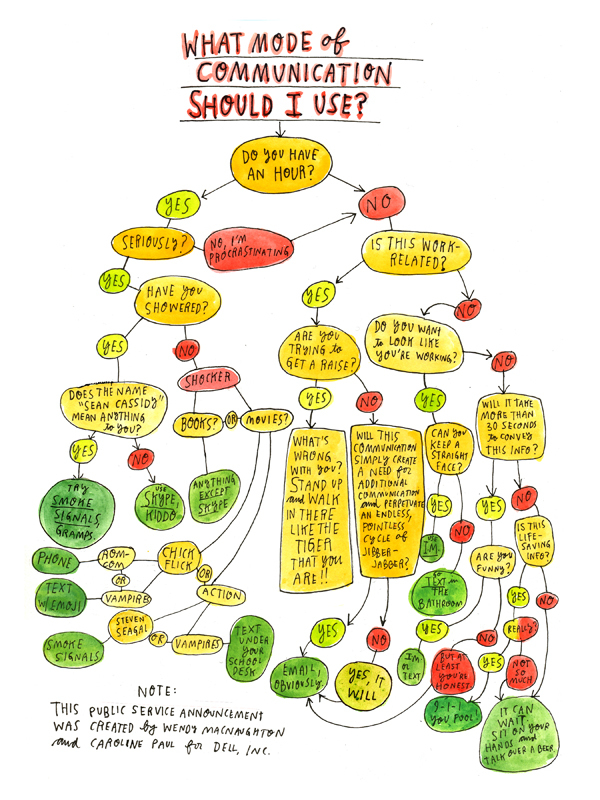 Illustrator Wendy MacNaughton and author Caroline Paul have created a funny chart that outlines your choices for communication tools. On a more serious note, there is a point to make here. With every communication you intend to initiate, choosing the right vehicle should be part of the planning. This could be as elaborate as a communication to introduce a new product or brand or a simple communication to announce an idea you have or something you want other folks to look at or work at. In this day and age the availability of communication tools has grown enormously and sometimes the choices can be overwhelming. So what guidelines can we use to sort out if we will call someone, organize a meeting, send a text message, handle by skype, facetime or google+ hangout or even send a paper document in the mail? Time management considerations are part of the choices but also the preferred method of communication by your intended audience. The cost of choosing the wrong communication tool can be huge, time wasted by confusing or vague understanding of your message to lost business opportunities due to unclear communications. Communication is all about exchanging information with the aim to change or impact behavior. The best way to accomplish that is to be as personal as possible, given time and location constraints. So if at all possible, use a telephone or a personal meeting to communicate so you can quickly read the responses of your communication partner and change, clarify or react on their responses. As time and location constraints will make this impractical you may need to resort to email, snail mail, or a group call or video conference. One thing to consider is the reliability of your chosen tool. Although a video conference allows you to have a better understanding of the other person by adding visual clues to the sound, having a bad connection can be so annoying that it distracts from your message and starts having an impact on the effectiveness of your communication or appreciation for the points that you are trying to make. Another point I need to make is that phone conferences, if not carefully managed can be very confusing. People typing on their keyboards while at a phone conference can disrupt the sound, people talking over each other can delay or muddle the flow of the conversation. Be careful with using text messaging as people are inclined to respond immediately and generally don’t give the topic or the response much thought. Also, text messages on a mobile phone can be intrusive while an email or snail mail just patiently waits there until proper attention can be given to the message.